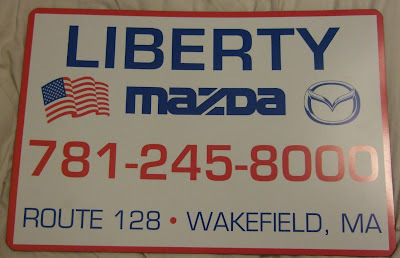 Liberty Mazda's Service department has really helped me out so many times that it's pretty much second nature to call them instantly if I need any sort of service done. The amazing service, quality, making sure I'm taken care of as well as any friend of mine that I've sent over for service as well. For that, I had asked if there was a way I could return the favor (not just by paying the bill!). So here is a magnet from them with their logo and information on it. Looks great! I may modify it a bit to fit nicely somewhere on the car, but we'll see. I'll try it out this weekend. Thanks Liberty!